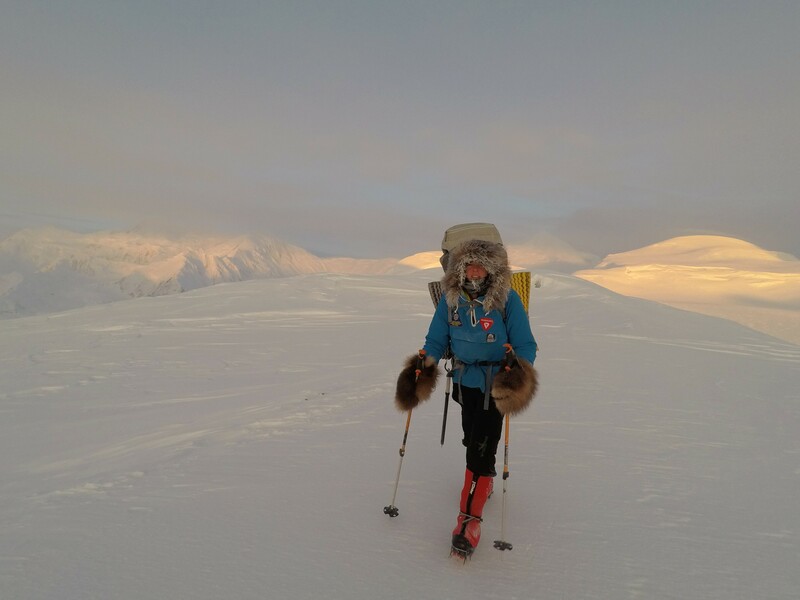 A winter expedition in such a remote wilderness as the St. Elias mountain range presents numerous challenges. Early in the planning stages for our “Lucania — A Frigid First” summit attempt, we worked with Parks Canada to develop the logistics around permits and emergency support at a time of year when personnel and rescue equipment is limited. Then came the task of finding a pilot who was willing to do a winter icefields landing in rarely visited territory. Ultimately, it all came together and we were ready. After waiting out a five-day storm in Whitehorse, the skies cleared and it was time to head out. The first twist in the story of our attempt came before we ever landed. From the plane, we observed that the access to the Washburn-Bates route was incredibly crevassed. Our primary landing location and all our planned alternate locations were a no-go, so we had to improvise in the air. We landed one glacier over at 3,050 metres — a high altitude for the little Piper Super Cub and for our sea-level-accustomed red blood cells. John, our pilot said, “Well it’s nowhere near where you wanted to land, but at least you can see Lucania.” We still hoped it would be possible to wiggle our way through the intimidating maze of crevasses. After spending our first day scouting a plausible route, we had to concede that it was impassable. On to plan B. From our viewpoint, our only alternative was to climb neighbouring Mt. Steele to get to Mt. Lucania. Re-energized and optimistic, we spent the rest of the day devising a way to get up onto its southeast ridge. 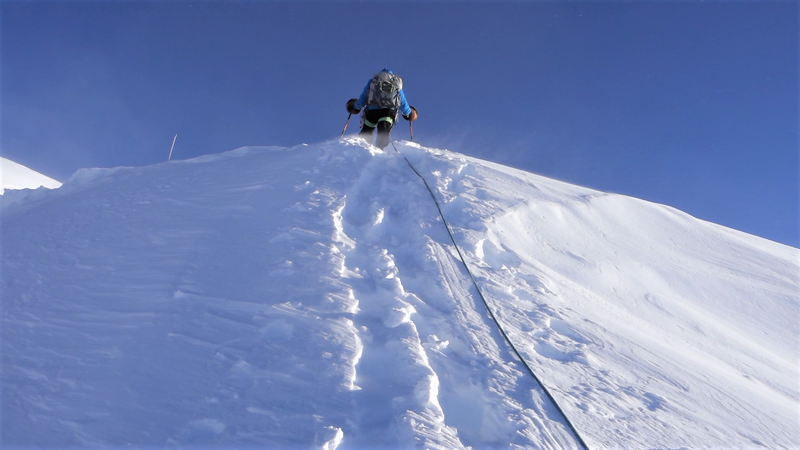 One option had us weaving through a heavily crevassed area, and the other up a steeper spine. We chose the latter, which was physically more difficult but much safer. This new approach meant that we were unable to use skis and sleds to pull up our supplies — we needed to triple-carry loads up 600 metres to the top of the ridge. With our objective still in sight, we resigned ourselves to the task and got the job done in four days. We then began traversing the ridge, encountering deep snow and lots of ups and downs. To our great dismay, on the other side of the ridge appeared a beautiful, gradual, crevasse-free snow ramp that led directly to the saddle we were aiming for. Our hearts sank. We could have landed on that glacier, but those are the breaks when attempting a first. Lucania has not been climbed in years, and nobody has been there in the winter. We were not familiar with all its routes and approaches. There is a greater risk of failure when there are so many unknowns, but exploration and improvisation are the most fun aspects of these expeditions. Weather is often the theme of any mountaineering expedition, especially one such as this, during extreme winter conditions. The oddest thing for us was to experience bluebird skies juxtaposed with fierce winds. When we peeked outside the tent door, it looked like we should be moving up the route, but we knew that to do so at -40 C, in those winds, would mean instant frostbite. When another bout of wind caught us off guard, we suddenly found ourselves in a dangerous predicament. Our tent was set up in a wind funnel on a high col. With our lives now at risk if the tent could not withstand the strong gusts, we had to suit up to re-orient our shelter. Even in this short foray, we both got frostnip on fingertips and faces — but our tent was at least secure. I took a twenty second moment under the bright sun and fierce gales to gaze at Mt. Logan and Mt. Lucania. It’s difficult to convey the majestic beauty, the solitude, and the rawness out there. One night, we both woke to the sounds of a significant icefall that triggered a monster avalanche. Moments after that, we heard the glacier shift with a loud bang. We knew something was up. We were informed the next day that an earthquake of magnitude 7.9 had occurred in the Gulf of Alaska. Although we did not feel it, we sure heard its effects, and the risk of aftershocks now factored into our route choices. Well-positioned at the foot of the climb, stocked with two weeks’ worth of food and fuel, and with our projected route seemingly straightforward, morale was up. Our backpacks were packed for the carry in the morning. We were feeling a little battered from the two-day wind storm, but also optimistic and eager to start more vertical climbing and less horizontal trudging. But that night, when we got into our sleeping bags, we both knew that the expedition was over. 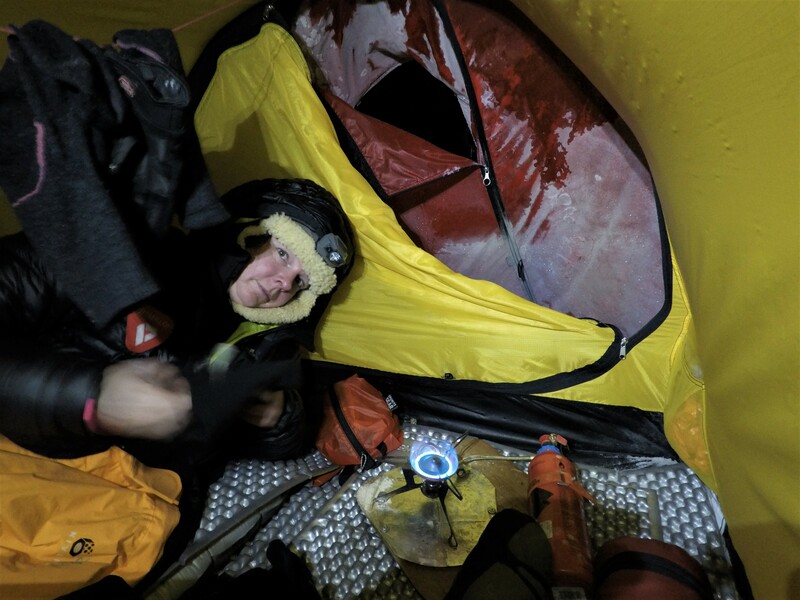 Early on we had noticed our sleeping bags beginning to ice up, but the last 36 hours of being tent-bound in the storm had dramatically increased the moisture in our bags. They were now a solid block of ice when coming out of the stuff sack. After prying them apart, we had to lay in our beds of icy, clumped-together down feathers and melt them with our body heat over the next two hours. Now lying in damp bags, it was virtually impossible to stay warm. We knew the icing would continue to worsen, that we had high-effort days ahead, that we would be chilled from the increase in altitude, and that two gale force wind storms were on the horizon, along with a plunge in temperatures. Continuing in these conditions with no way to sleep or stay warm at night was flirting with disaster. Sometimes the decision to turn around is tough to make, but our choice was clear. There was no way we could safely proceed given the iced-up condition of our sleep systems. I was less sad than might be expected, mainly because we were content with what we had accomplished and learned, and we feel better prepared for a stronger attempt next time. We now know that we have a solid approach route, one that will allow us to pull our supplies up to a closer basecamp and tackle the mountain in a fresher physical and mental state. Retracing our steps after the storm was fascinating; scoured by the relentless wind, our footsteps had formed incredibly beautiful sastrugi. We still had a nagging concern about our pick-up, however. Given our high-altitude landing, we were worried about taking off fully loaded. 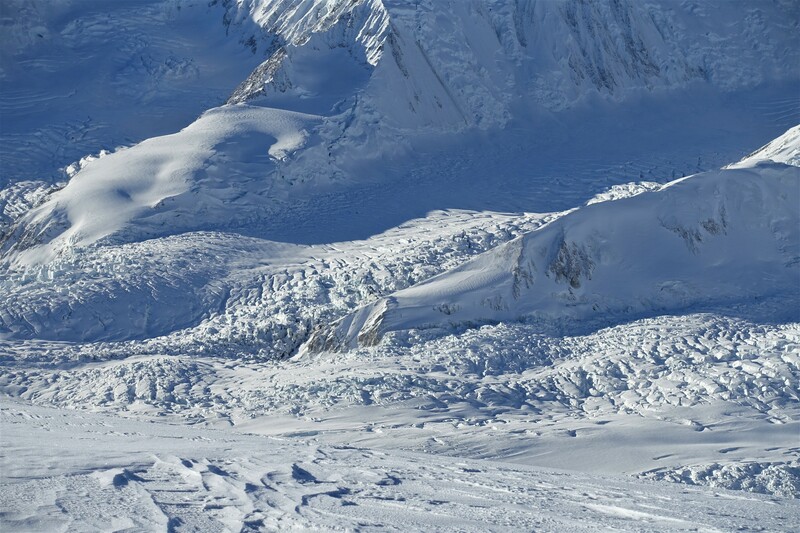 Getting to a lower altitude was not possible due to a large icefall below the glacier. We understood that we might need three flights out, or perhaps a helicopter. The sastrugi, too, although lovely, were an issue. The soft, deep powder had been replaced by an ocean of hard packed snow waves. Lonnie spent a couple of hours searching the glacier for a “flat” area, just long enough for the plane to land and take off. We found one, then got to work shovelling and stomping down some of the larger humps before informing John that the makeshift runway was flagged, safe and ready for landing. When one tackles such “firsts,” one knows that there will be a steep learning curve. Terrain, route, weather patterns and even the logistics of getting to and from the mountain are to a large extent unknown and unpredictable variables. The beauty of exploration is that we build contacts and develop knowledge together, as a united team: Parks Canada, Rocking Star Adventures and ourselves. So, goodbye for now, gorgeous alpenglow sunrises, pink-and-blue skies, endless vistas of icy peaks, raging winds. You are full of character, dear St. Elias mountain range, and we will be back next winter to take in all that magic once again.